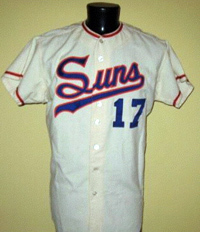 MLB Players of this era were issued only two home and two road jerseys per season, and the fine wear is appropriate for an estimated forty games of use. Pick any road event from the 1954 season, and there's a 50/50 chance “The Commerce Comet” was sporting this very jersey. And the odds were good that he posed for his 1955 Bowman baseball card (inset) in this classic flannel shirt. And he was likely w earing this very shirt when he made himself an unwelcome “visitor” by hitting a late-inning pitch entirely out of the Detroit Tiger’s Briggs Stadium on August 8th of that year. A sweat-stained swatch inside the collar features an embroidered "Mantle M," while "1954" is stitched below the "Wilson [size] 44" in the tail. A final bit of appeal comes with the application of “The Mick’s” perfect blue sharpie signature inside the collar. 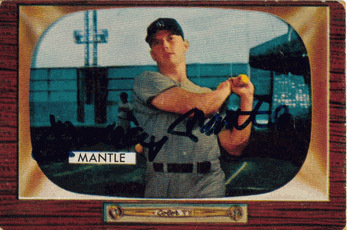 "If I had known that one day a collector would pay that much for one of my jerseys at an auction, I would have hung on to more of the bats, homerun balls, and World Series rings... and I probably would have slept with that jersey." Mickey Mantle (536 career homers). There are game-worn jerseys and there are SPECIAL game-worn jerseys. 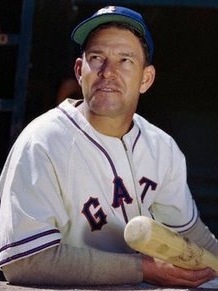 There's no doubt this Mel Ott 1945 New York Giants home flannel, from the season he became the third member of The 500 Home Run ClubTM (after Babe Ruth and Jimmie Foxx), falls into the second category. 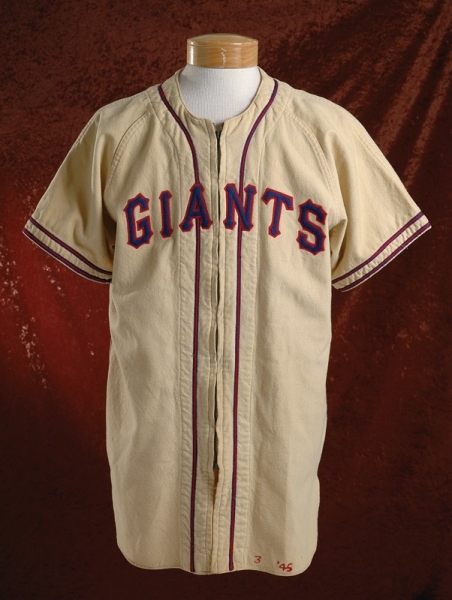 History shows that “Master Melvin” was sporting a jersey that featured a uniquely patriotic blue on red "GIANTS" logo (worn only during World War II) with a zippered-front (like this one) when he hit his 500th homer on August 1, 1945 off Braves’ pitcher Johnny Hutchings at the Polo Gr ounds. In fact, this may be it, but we cannot say for sure since each player was provided with two home and two away jersey. But there’s a 50/50 chance this is the actual shirt Ott was wearing when he joined our exclusive club. This remarkable piece of history, which features Ott’s Number "4" on the reverse side together with "Ott" chain-stitched in red in the collar, was consigned with a Letter of Provenance from Bruce Erickson, whose father received it after Ott’s retirement. This jersey had not seen the light of day in sixty years, before being offered for sale in 2006. The FIRST National Leaguer to 500 taters, Ott's total of 511 career knocks wasn't surpassed until 1966 when Willie Mays got #512. 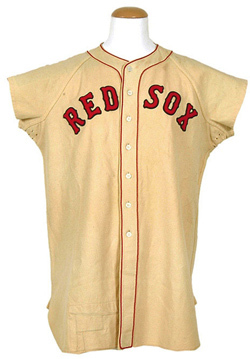 Even a common player jersey from 1940 would be a great rarity, but this one is really special because Ted Williams wore this Boston Red Sox home flannel jersey in 1940, his second season of Major League baseball, during which h e hit 23 home runs, 113 RBIs, scored a lead-leading 134 runs, and batted .344. 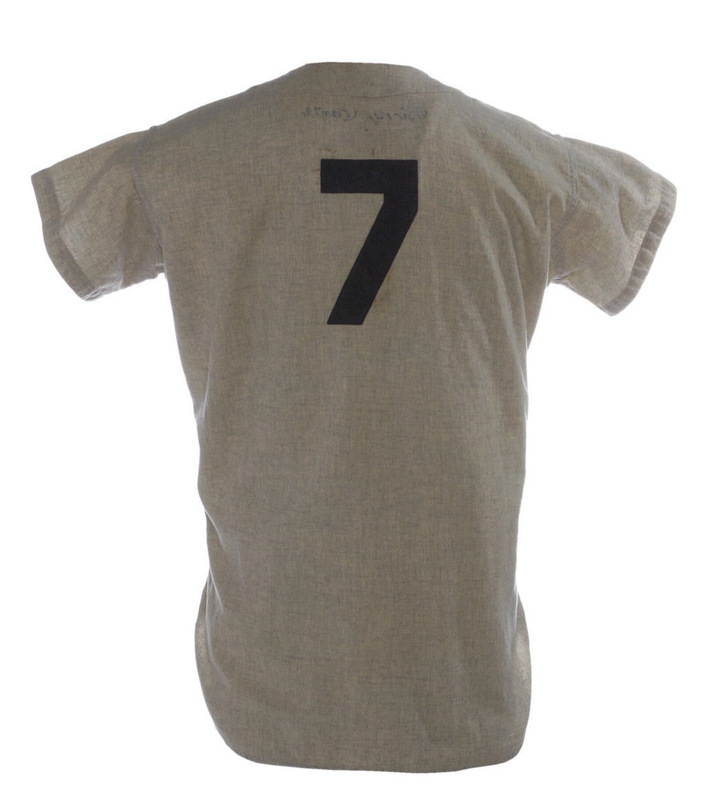 This is one of the earliest and most significant Ted Williams game-worn items in existence because it is one of only a few that survived from the ‘40s, and was given by the “Splendid Splinter” himself to a friend, who years later passed it on his grandson. 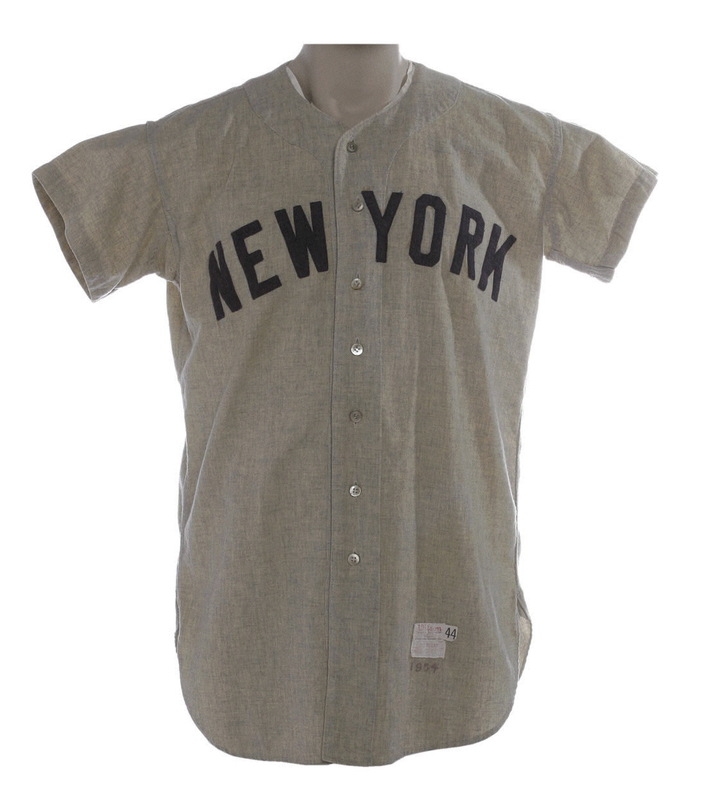 "Ted Williams" is embroidered in the neck over the classic Spalding logo and his jersey size 44. In addition, the marking “40” has been sewn in red chain stitch inside the back tail to mark the 1940 season, William’s second in the league. 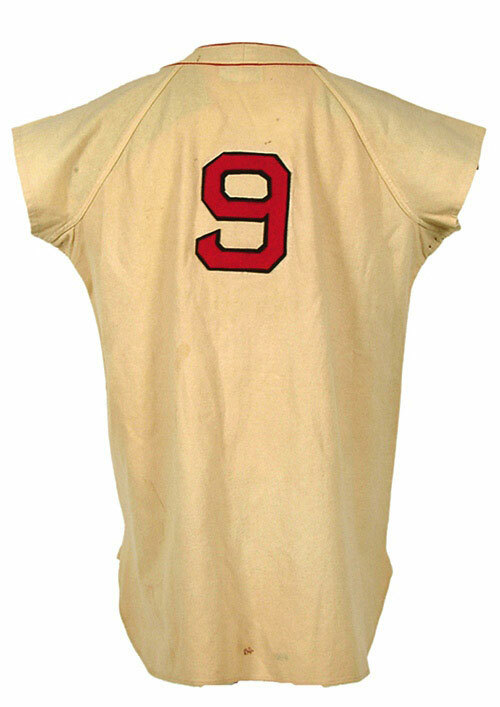 Across the front of the jersey is "Red Sox" and on the back is the player number "9." The sleeves have been custom-cut and hemmed to Ted Williams' special specifications. In March of 2007, nearly 30 years after “Mr. 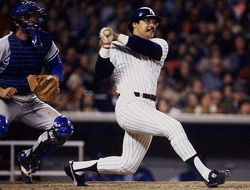 October” Reggie Jackson hit three homes runs in Game 6 of the '77 World Series, his road jersey from 1977 was sold at auction for $20,360.00. In 1973, Jackson befriended a young Oakland A’s locker room assistant named Robert Villegas and both stayed in touch after Reggie headed east to NYC. 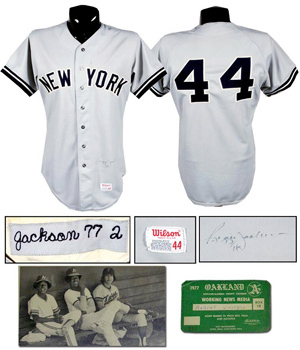 In 1977, during the Yankees’ final regular season trip to Oakland, Jackson gave his road Yankees jersey to Villegas, and he autographed it. Villegas was an enthusiastic uniform collector, and his position as a visiting team batboy furnished him access in acquiring other jerseys. But none, by his own declaration, meant as much to him as Reggie’s from 1977. The jersey is spectacular in styling and evidence of wear, and its provenance is absolutely unquestioned. The NEW YORK front is well-puckered and the squatty-block "44" on the back exhibit surface softness and degradation, along with solid edge wear. The collar swatch, “Jackson 77 2, and the creamed-out cotton collar/button path lining are a wear aficionado’s dream. This is a very rare game-used Rawlings jersey worn by Mexican baseball great Hector Espino Gonzalez (aka The Mexican Babe Ruth). A symbol of Mexican pride, the slugging Espino is the all-time Minor League home run hitter with 484 long balls. After being named the Mexican League Rookie of the Year in 1962, he led the league in home runs in 1964 and 1972; batting average in 1964 and in 1966-68; and in RBI in 1962 and 1973. His Mexican League homerun record of 46 long balls, set in 1964, stood until 1986. Although he received offers to play for the Cardinals, Mets, and Padres, Espino opted to remain in his Mexican homeland for the majority of his career. He did play 32 games for Jacksonville (International League) in 1964, batting .300, but was offended by racial discrimination and swore he would never again play in the United States. He retired at age 45 after playing 25 seasons and was inducted into the Mexican Baseball Salon de la Fama in 1988.